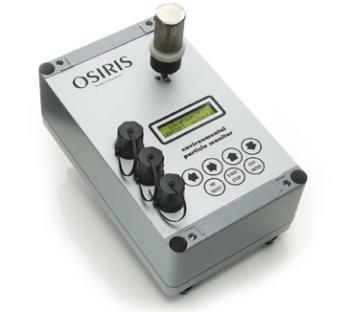 One of the family of Turnkeys direct reading airborne particle monitors, Osiris is a general purpose instrument which can be used as a portable instrument or deployed in a semi-permanent installation. Fitted into a Turnkey Lamp Post Box, Osiris can be quickly deployed to study short or long term pollution hotspots in towns and cities and exceedance areas rapidly determined. Osiris will continuously indicate the concentration of TSP, PM10, PM2.5 and PM1 particles with a resolution of 0.1 micrograms per cubic metre. In its workplace mode, it will indicate inhalable, thoracic and respirable concentrations. Osiris has achieved the Environment Agencys MCERTS certification, ensuring its accuracy in recording data.